Military Care Package #2, a box crammed full of cookies, calories, smiles, thanks, and best wishes, is winging its way to Afghanistan as I write this. The first box reached Paratrooper Derik in just 8 days! Mail travel time to deployed military can take much longer. I have heard of shipments taking three or more weeks. All reports are that the International Monday Box arrived intact and accomplished its mission to provide thanks and a sweet taste of home. I send the military care packages in a large flat rate box from the post office. It’s a deal. First, the post office provides you with the box. You can even order Military Care Kits from the post office that will be delivered to your door free of charge. The Care Kits include boxes, labels, customs forms, and packing tape! (Call 800-610-8734 to order) Large flat rate boxes to military addresses currently cost $15.45 to ship, a $2 discount off the domestic shipping rate. The care package contents are limited by the size of the box, but I use my ancient Tetris skills to squeeze in as many cookies as possible. Part 1 Care Package Contents: I went with a holiday theme again for Care Package #2. This was the first Easter basket/care package this Jewish girl has ever created. I had fun. The quantity and variety of chocolate in the Easter aisle at Target is staggering. Too many choices, too little space in the flat rate box! Eventually I made my selections. Warm weather precautions for shipping to Afghanistan begin in May, so I didn’t stick to desert-safe rules for this box. 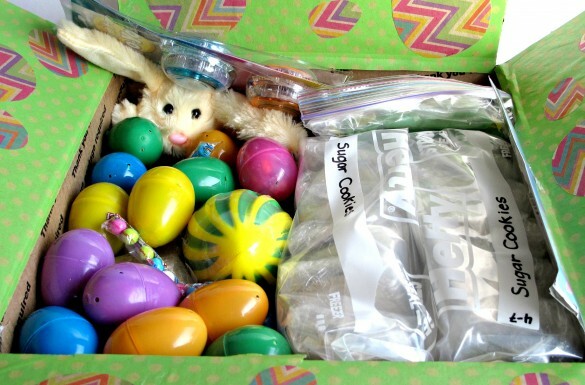 Ten brightly colored plastic eggs were filled with wrapped Jolly Ranchers (hard fruit candy), foil covered mini chocolate eggs, and cellophane strips of Sixlets (tiny candy coated chocolate balls). Just for fun, I also included packs of gum, Easter/spring decorations, yoyos, a small foam football, and a light up bouncing ball. Yes, that is a little stuffed rabbit peeking out from under the yoyos. 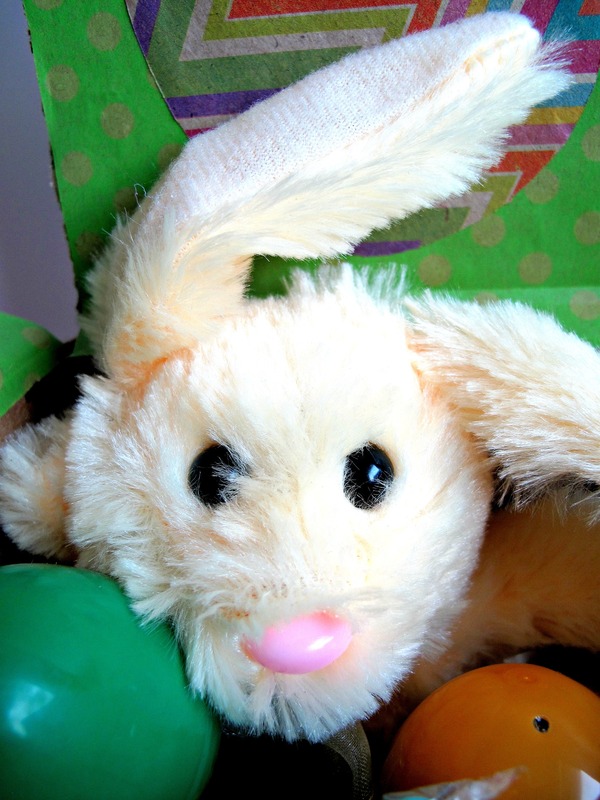 Yes, I am aware that sending a wee fuzzy bunny to a big, burly Paratrooper may seem odd, but I included the little guy based on the extensive experience of Operation Gratitude, who recently mailed their one millionth military care package. They include a small stuffed animal in every box. Recipients have used the toys as mascots, good luck charms, gifts to local children, and as gifts to their own children when they return home. Also, my research indicates that there has to be an Easter Bunny to deliver this Easter basket/care package. Hidden from view, under all of those cookies, is an uncut pan of Cadbury Crème Eggs Stuffed Brownies. 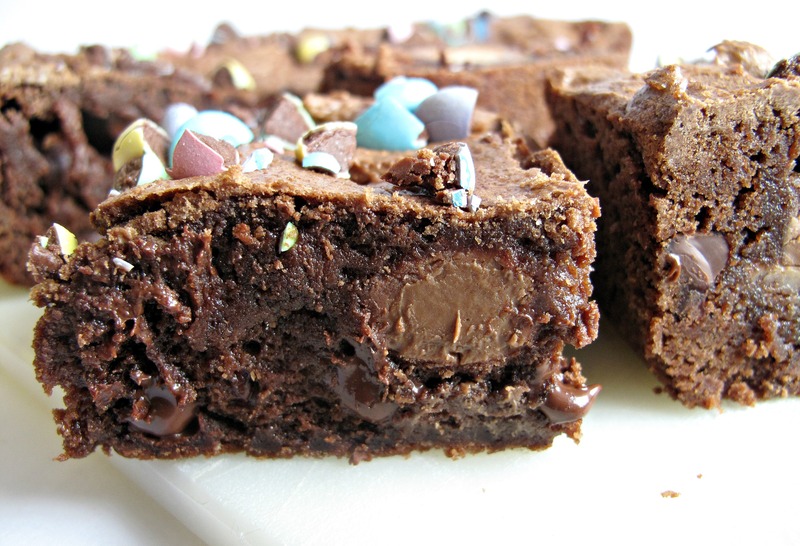 I used the desert-safe recipe for Hugs and Kisses Brownies with two Easter candy adaptations. 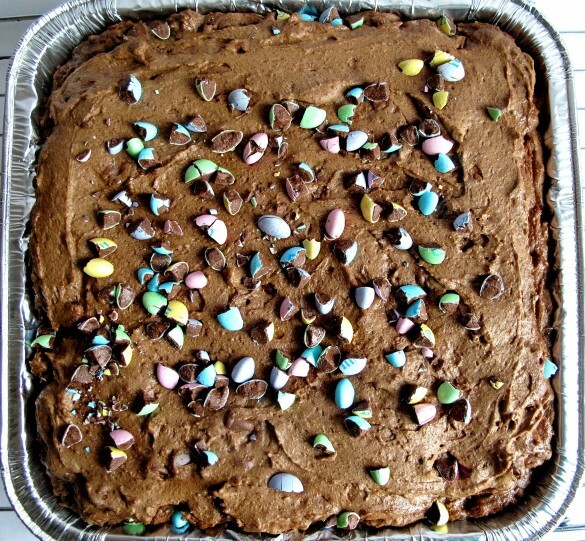 After spreading half of the batter into an 8” x 8” foil pan, I placed 16 (unwrapped) Cadbury Crème mini eggs on top. 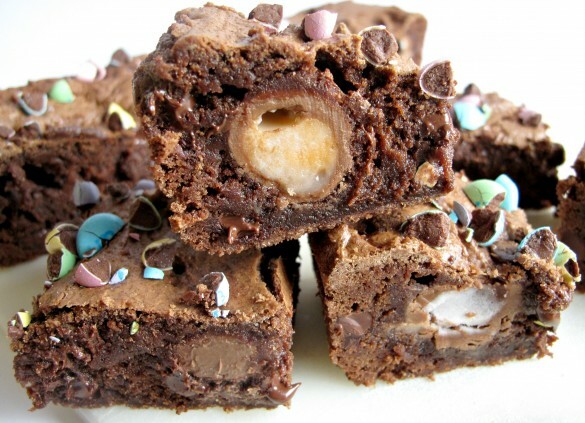 The remaining batter was spread on top of the chocolate eggs. Just for color appeal (and because the Target candy aisle proved irresistible) I sprinkled chopped Easter m&m’s over the batter before baking. Part 2 Circle Sugar Cookies: I tried to follow my own advice to keep the decorating simple and easy. I think I accomplished that, but then blew it on time saving when I chose to do two different designs. In my defense, as I mentioned, this was my first time playing with Easter themes, and there were too many adorable possibilities on Pinterest to choose just one. Both the bunny and the chick designs are easy enough for decorating beginners. I used the vanilla and chocolate sugar cookie recipes from Lilaloa (one batch each) and faux royal icing from Bakingdom (one batch for each design). (The same sugar cookies I used for my Birthday Cake Cookies and Snowmen.) Each design used one main color and one accent color. The cookies are outlined, then flooded in the main color. I used black confetti sprinkles for the eyes and pink heart sprinkles for the bunny noses. The sprinkles should be added while the icing is wet (easier) or can be glued on with a tiny dab of icing if you forget (voice of experience). Allow the icing to dry completely, preferably overnight, before piping on the chick wings/feet/beak or the bunny ears. Full disclosure: I meant to add a white bunny tail and totally forgot. Luckily, the cookies taste great even without a tail. Make sure to allow plenty of drying time before wrapping. I double wrapped pairs of cookies, with bottoms together, in plastic wrap, then placed the bundles in a column, in a large, freezer weight ziplock bag. Part 3 New Recipe: Oreo Stuffed Chocolate Chip Cookies, the wondrous creation of Picky Palate, are as amazing to eat as they are to look at! 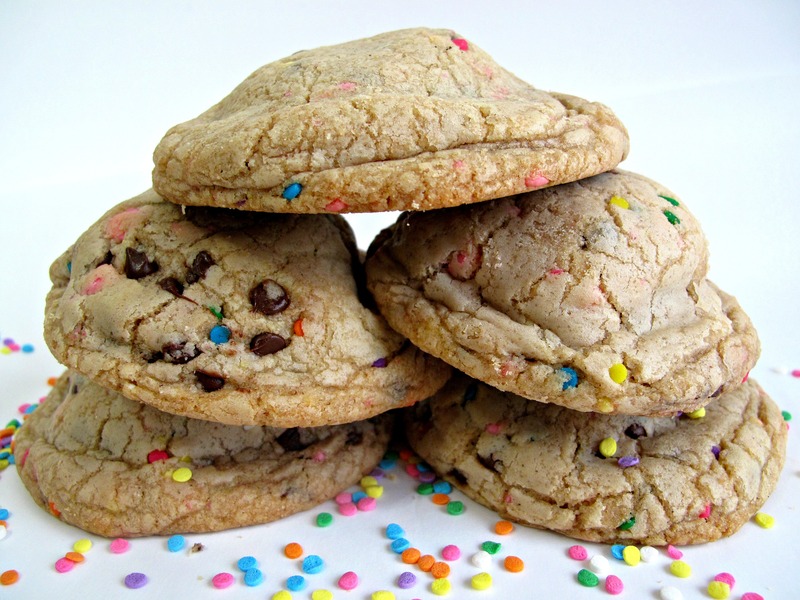 These are enormous chewy-crunchy three- in-one cookies. An Oreo is sandwiched between two scoops of chocolate chip cookie dough. For diverse color and because I tend to over-do, I used Birthday Cake Oreos (white funfetti cream), Raspberry Oreos( pink cream), and Spring Edition Oreos (yellow cream). 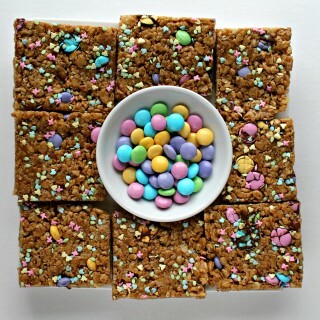 For additional Easter flair, I added some pink and yellow Nestle’s Spring Edition chips and a few tablespoons of confetti sprinkles. Baking note: To disperse the chips throughout the dough and to avoid chocolate chip lumps, I chopped the colored chips by pulsing them a few times in the food processor and used mini semi-sweet chips. Oreo Stuffed Chocolate Chip Cookies definitely have “wow factor” but more importantly they also have “yum factor”. They are a hefty cookie that made me glad that I was using flat rate rather than weight to ship these. Wrapped well and stored in an airtight container at room temperature, Oreo Stuffed Chocolate Chip Cookies stay chewy for at least 1 week and then become increasingly crunchy, not a bad thing where Oreos are involved. I recommend serving these cut in half, in order to fully appreciate their festive beauty. • Preheat oven to 350˚F. Line a baking sheet with parchment paper. • In a large bowl, whisk together flour, salt, and baking soda. Set aside. • In the bowl of an electric mixer, cream together butter and sugars until fluffy (about 3 minutes). • One at a time, mix in eggs and vanilla until well incorporated. • Slowly add the flour mixture just until combined. Stir in chips and confetti sprinkles. 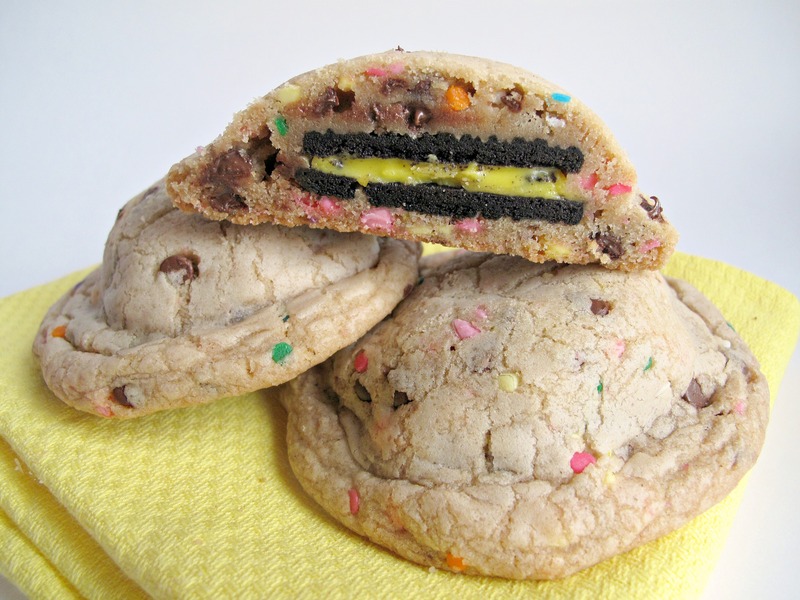 • Use a 2 tablespoon scoop to place one scoop of dough on top and one scoop of dough under an Oreo. Use hands and fingers to flatten the dough around the Oreo, covering the entire cookie and sealing the edges. • Allow to cool on the baking sheet for 5 minutes before transferring to a wire rack to cool completely. • When completely cool, store in an airtight container at room temperature for up to 1 week. 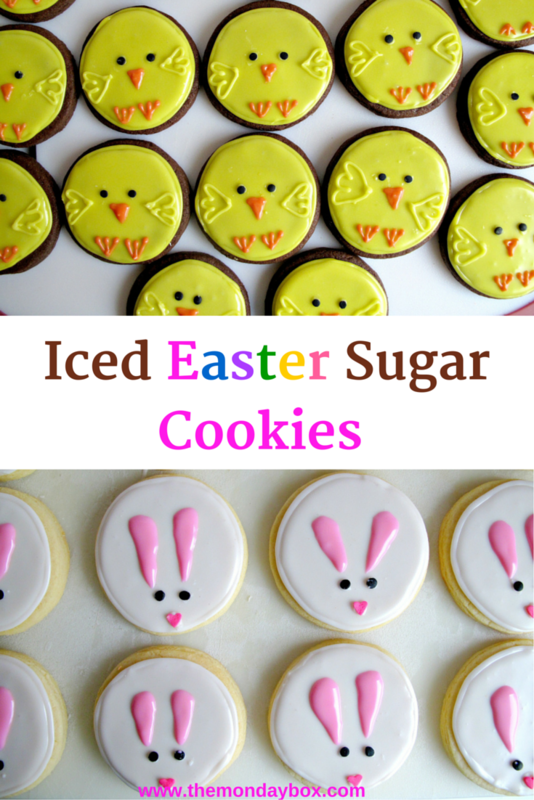 Still hungry for Easter cookie recipes and care package ideas? Click these photos for the recipes! Thank YOU for all you do to encourage and support our men and women in the military! One million care packages is an astounding amount of dedicated work and joy spread! No way! They look TOO amazing! What a lovely thing to send! Thanks you! These cookies are amazing to eat too! 🙂 I hope Paratrooper Derik and his buddies will be amazed as well! I am sure they will! It’s so sweet of you to send them! I love these posts on the military care packages! They really make me smile every time I read one! All these goodies look and sound delicious (I personally love those sugar cookies – they came out adorable!). And you made me chuckle with the Tetris comment – my sister and I loved that and pac man. We were obsessed. Thanks! 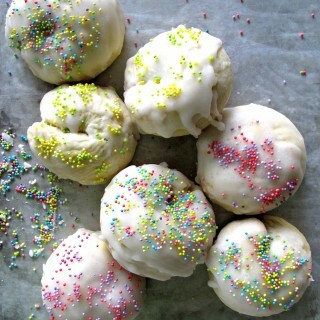 Sugar cookies are great for care packages and this Lilaloa recipe tastes so good! I decorate them because its fun and practice should eventually show improvement. 🙂 Isn’t it good to know that skills honed from ancient gaming obsessions can be put to good use?! 🙂 I know that you have sent your share of military care packages, Ashley, so any advice is always appreciated. These look so yummy Wendy!!!!! and they are colourful too!!! What an amazing post. I wonder if we do anything similar from the UK? Your post had me drooling and smiling- what a completely wonderful thing to do! Thank you, Keren! I am awed by the sacrifices made by the military and their families. A “thank you” care package” seems like such a little gesture but words/cookies of thanks and support are appreciated. I would think that sending care packages is an international thing (unfortunately, we all have soldiers far from home). What a wonderful, thoughtful care package, Wendy! I love the holiday theme. The treats look delicious – you are really good at decorating those cookies!! : ) I’m sure your thoughtfulness will creates plenty of smiles. Thanks, Monica! I have been collecting things here and there (dollar store, Target, grocery, etc.) as I see them with smile potential in mind. 🙂 Its fun to do and hopefully conveys the message that our military are thought of and appreciated. Sending off Monday Box recipes to Afghanistan definitely puts them to the test! So far, so good! 🙂 Thanks for the decorating compliment. I see so many beautifully decorated cookies online and wish I could create even basic ones as well! Practice? Everything looks amazing! I know our troops will appreciate it. Those care packages are just the sweetest, Wendy, and so are these cookies! 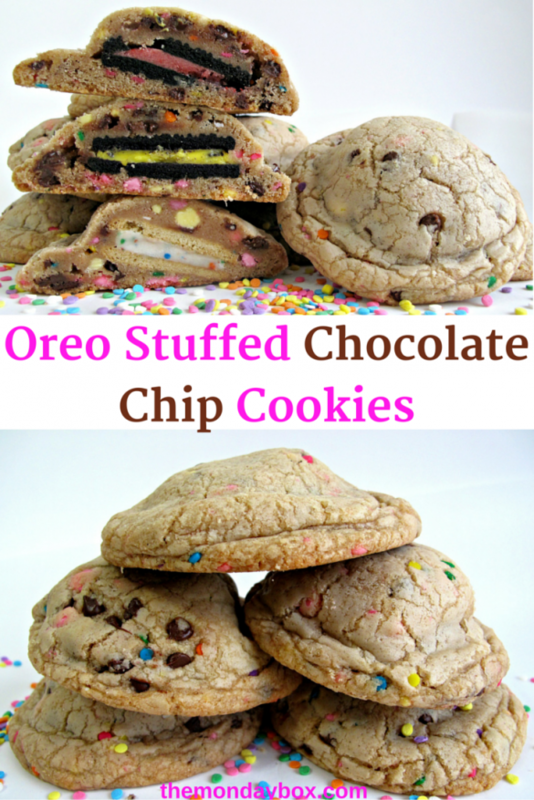 I love the bursts of color and the secret surprise of an oreo cookie inside ANOTHER cookie! 😀 So many levels of awesomeness! Thanks, Winnie! I do hope these cookies will sweeten the day for guys eating them! You are the best, Wendy! 🙂 I’m smiling just thinking of the smiles your sweet gifts will bring!! Awesome cookies, too! I’m in love with the cute chicks and bunnies! You are doing some really awesome things, Wendy! 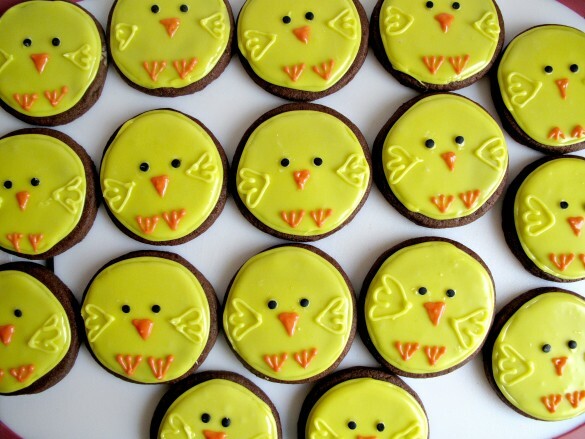 Those chicks and bunnies cookies are so cute and festive. I am sure the troops will be thrilled to get your care package. I didn’t know you can order a military kit to home and do it yourself. I definitely need to check it out. Thanks for all your great works! Yes, yes to all of these! What an awesome care package–everything looks fantastic. That is one luck soldier! I’m dying ! This package is so sweet ! 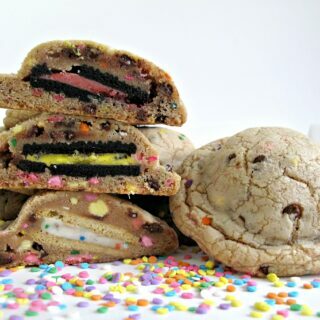 Love the little sugar cookies and the oreo stuffed cookies are completely crazy ! Also those brownies… I’m so sad I can’t succeed at making good american brownies, they never taste the same as those I eat in NY. Well, this package is full of love and delicious things. I always have so much fun putting together a care package. My hope is that I communicate that fun and care to the person who receives it! Hey, These yummy cookies are great ideas for in care package. I like Oreo Stuffed Chocolate Chip Cookies most. because it will not melt in even at hot temp. because care package takes 8 – 10 days times for delivery. there is a some items i.e made of only chocolate are melt in 8 or 10 days, when sending to location like Afghanistan. This is just my thoughts & tips. But all of yours cookies are awesome & yummy…………. Thank you! You are right! As the temperatures go up, its ever so important to keep the travel time and weather in mind when sending a care package! If you do a search on The Monday Box for desert safe, you should find more than 20 recipes that were baked with desert safe guidelines in mind. I hope you find more recipes that your military friends will enjoy! Hello deliciousness! These look amazing and such a sweet idea! Thanks, Cara! It’s fun to try different flavors of Oreos inside! This care package is so sweet! Love all the goodies you have put in. 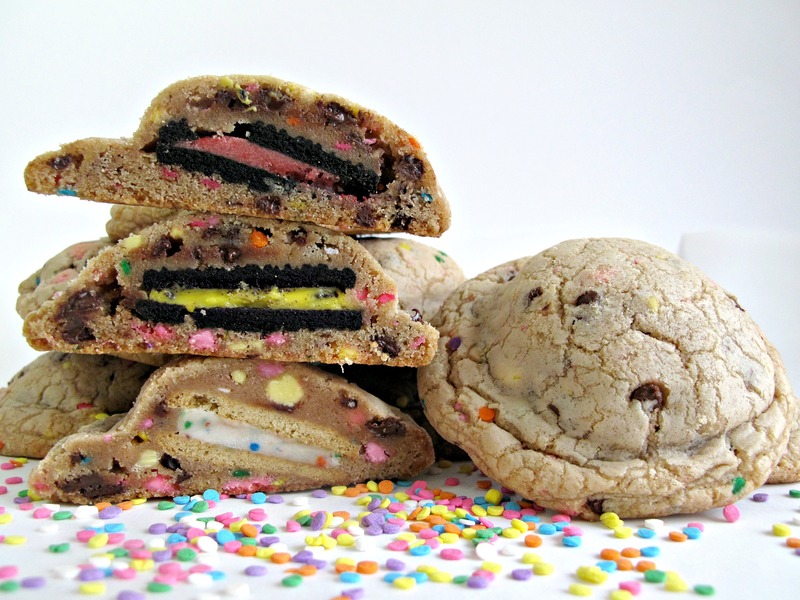 The Oreo stuffed cookies look divine! The sugar cookies are so cute. 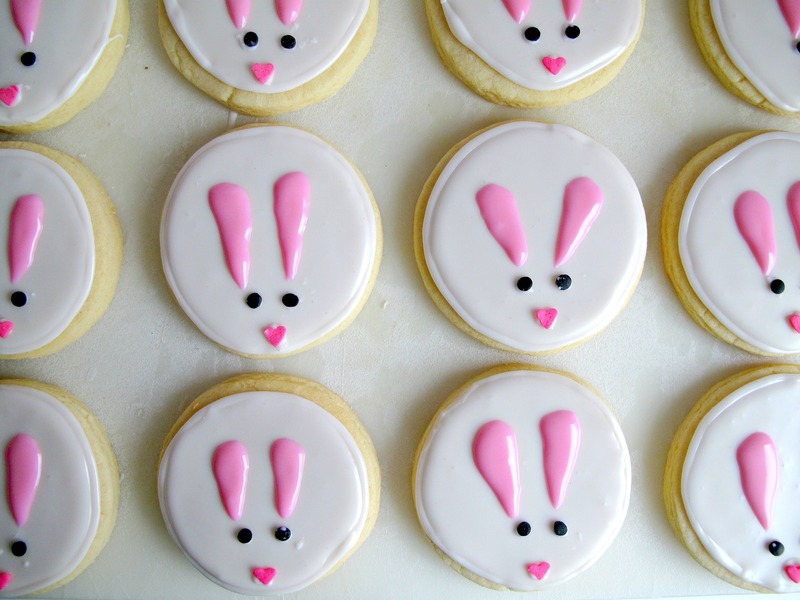 I love the bunny cookies, they look beautiful and delicious! Great to connect with your through the Happiness is Homemade Linky Party! 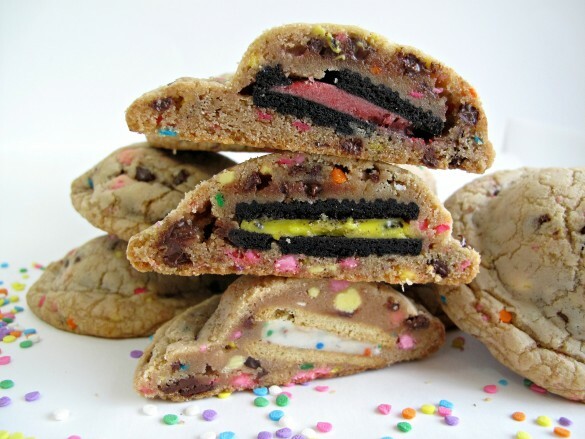 I don’t even like OREOS but you better believe I want like 10 of these cookies! Thanks, GiGi! I can’t imagine not liking Oreos! They are the only packaged cookie I find really hard to resist. 🙂 Wrap them in chocolate chip cookie dough it could be even harder to resist! Thanks, Mollie! Two favorites in one! Oreo filling comes in lots of colors for variety. I will just have one of each of these awesome cookies, they all look so special. God Bless you for making such wonderful boxes for these very important folks! Hope you have a very special week and thanks so much for sharing with Full Plate Thursday. What a totally awesome idea! This care package is amazing! Thanks for linking up with What’s Cookin’ Wednesday! Thanks, Karly! I love putting the care packages together and anticipating the smiles when the boxes are opened! Thanks, April! These cookies give you two favorites in one! Thanks also for pinning! I will take a look at your recipe party. Sounds like fun! Does it get any more decadent than those oreo-stuffed chocolate chip cookies? Yum! 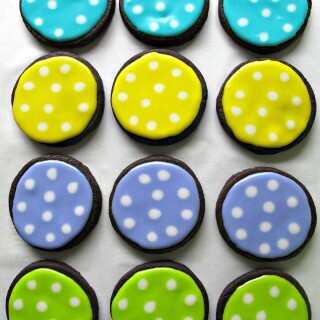 I love the hint of color in the middle that the colored oreo creme gives. 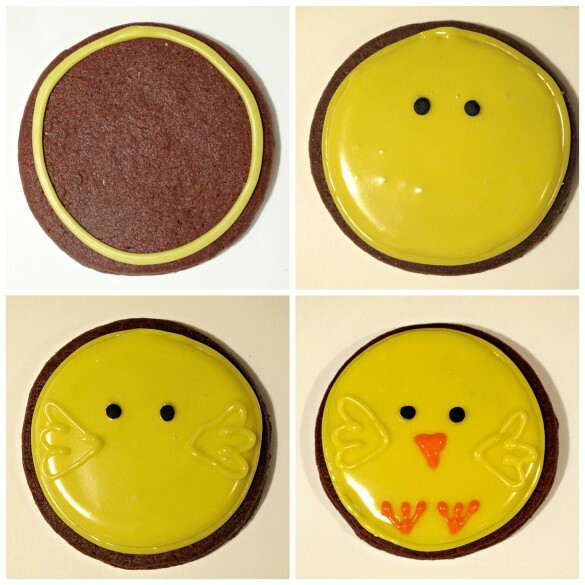 Your bunny and chick cookies are sweet, too! I’m certain that those who are lucky enough to receive one of your boxes are not disappointed. Such a neat project. Pinned. Just wanted to let you know that your cookies are being featured this week! Thanks for sharing last week and I hope you come again! Thanks, Julie! 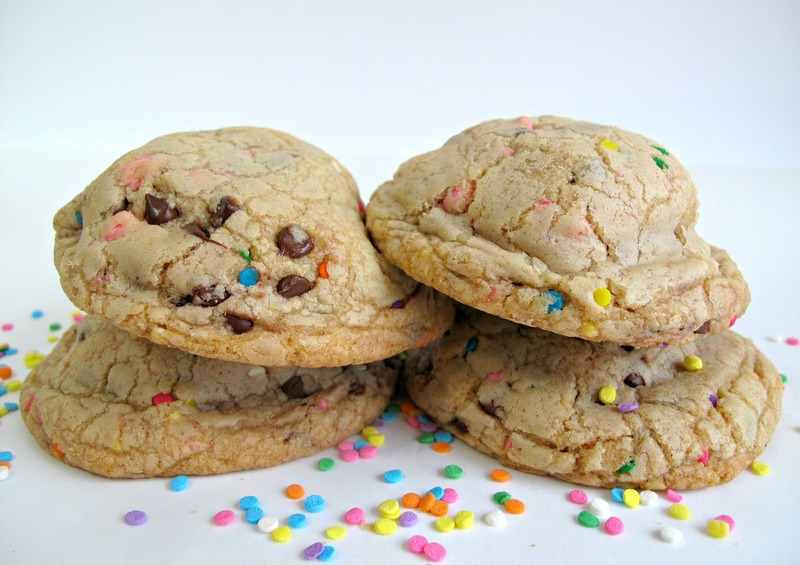 The stuffed cookies are definitely a decadent surprise cookie! Thanks for your kind words. I am always hopeful that the military care packages will create smiles and give morale a boost. I just pinned your awesome box of cookies, our military members would love this special box! God Bless You for all you do! Hope you are having a great weekend and thanks so much for sharing with us at Full Plate Thursday! I am truly grateful for your enthusiasm and support of my Soldiers Angels care packages! What I do is so minuscule, but it is my effort to give thanks and moral support to our military, who put their lives at risk for all of us.